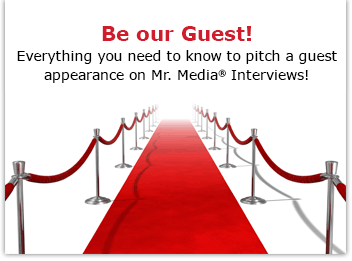 Every week, Mr. Media posts lively, thought-provoking, funny and even musical interviews with guests representing a wide spectrum of entertainment, politics, business sports and more. These were simply the very best interviews of 2014! When I was a rock critic in the 1980s, I avoided Parker. He had an ugly reputation with journalists and who needed the aggravation? But thanks to a charming documentary about his life and career, I couldn’t resist the opportunity to speak with the legendary singer. And it was worth the wait. Marc Guggenheim knew, and I knew, that his ongoing work as a writer of The CW’s hit “Arrow” was what drew our attention to him, but his first novel, Overwatch, really is a tremendous read, a first-rate page-turner. Two performances by the Levinson Brothers from the video musical “2776” were the highlight, but I still remember the look on Rub Kutner’s face when I interrupted him to say his boss, Conan O’Brien was calling in. Good times! Great music by Josh, of course, and a cameo by his dog, too. And all of the Friedman men have now been guests: novelist dad Bruce Jay Friedman, artist Drew Friedman, and memoirist Kipp Friedman are all in the Mr. Media archives. Ostensibly, this was going to be a trip down memory roe with Tommy recalling how The Beatles opened for him on tour in London in 1963 and that he opened for them in the first U.S. concert in January 1964. But then I noticed he had a guitar sitting next to him and coerced the man behind massive 1960s hits such as “Dizzy” to play for us — twice! The show-stopper moment for the star of the 1970s ABC-TV sitcom “Soap”: watch when Johnson throws his voice 3,000 miles to the dummy in my lap. That’s entertainment! I was excited to have 91-year-old Bikel as a guest — he co-starred with Humphrey Bogart and Katharine Hepburn on The African Queen, for heaven’s sake! And he didn’t disappoint, offering up stories of a lifetime of co-stars, film and theater experiences, memories of Nazi occupation in World War II, and of his parallel life as a social activist. Great stuff. This was just more fun than any other interview in 2014, not only for me but for viewers and listeners. Capaldi came to the show to promote his turn as Leonardo da Vinci in the documentary, Inside the Mind of Leonardo da Vinci 3D. I was warned — twice! — not to focus on “Doctor Who” so I didn’t bring it up until near the end, which he seemed quite cool about. He was funny and engaging, exactly as you’d want him to be. If only I had had time to set me up with me dream date, The Doctor’s adorable companion, Jenna Coleman!